Corn meal is used by organic gardeners to help fight and prevent lawn diseases caused by fungus. Applying at a rate of 10 lbs per 1,000 square feet every month helps prevent disease, 20lbs to fight an active disease. It is also a very mild fertilizer. Around 1.7-0.7-0.4 NPK. It's not just good for your lawn but also other plants (roses) and vegetables (tomatoes) that are susceptible to disease. I just found something that I think is worth sharing. It's going to be a little more expensive than buying it from your supermarket, which is already more expensive than buying at a feed store or wholesale food distributor but you get the benefit of having it delivered to your home every month for free! I've never been to a feed store and don't have any locally. No excuse to forget it. It comes, you apply! And it's 100% organic so you're not applying genetecally engineered products to your organic lawn. It's normally about $35 for 24 lbs with free shipping, but if you order a subscription it's only around $30. There is no obigaion. You can discontinue your subscription when you don't need it. You just have to remember to start your subscription in early spring when you start getting your lawn ready to wake up. Click here to order your free delivery subscription of Organic Corn Meal now. 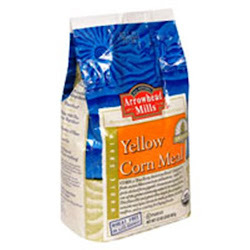 UPDATE: Also recently found Great River Organic Milling, Organic Specialty Corn Meal, 25-Pound Package which is a better deal Even more so if you subscribe to receive it monthly.